Class Day speaker Natalie Portman (photo 1) urged students to take advantage of the brimming self-confidence of youth and take chances even at the risk of not coming out on top. Samuel B. Clark '15 (photo 2), one of three Class Day orators, offered humorous remarks, while the audience enjoyed the mild weather (photo 3). Natalie Portman, the Academy Award-winning actress, returned to Harvard Wednesday afternoon to address graduating seniors during the annual Class Day celebration in summery Tercentenary Theatre. Portman, 33, who attended Harvard College from 1999 to 2003 and earned an A.B. in psychology, reflected on her own experiences at the University and in her career as she battled self-doubt. Even 12 years after graduation, with an enviable body of work and a rich personal life, she confessed to still feeling pangs of insecurity. Academy Award-winning actress Natalie Portman ’03 addresses graduating seniors at Harvard’s Senior Class Day ceremony on May 27, 2015 at Tercentenary Theatre. Portman, who was born in Jerusalem but grew up in Syosset, N.Y., made her film debut at age 11 as an orphaned waif who befriends an assassin in the stylish French action picture “Leon: The Professional” (1994). Although the film was not a critical or box-office success, Portman said she feels “lucky” to have discovered that she loved acting without being distracted by the rewards of fame and fortune. Since then, Portman has appeared in close to 40 feature films, working with many of the industry’s top directors, including the late Mike Nichols, Woody Allen, and Tim Burton. Her filmography ranges from summer blockbusters like the last “Star Wars” trilogy to critical darlings like the 2004 indie film “Garden State.” It’s a deliberately broad palette that she said comes from following her own instincts and passions, not management advice. Portman counseled the graduating seniors to find their own internal motivation and satisfaction from the choices they make in their lives, and not to allow others’ opinions or expectations to rule them. “Sometimes your insecurities and your inexperience may lead you, too, to embrace other people’s expectations, standards, or values,” Portman said. “But you can harness that inexperience to carve out your own path, one that is free of the burden of knowing how things are supposed to be, a path that is defined by its own particular set of reasons. “Achievement is wonderful when you know why you’re doing it. And when you don’t know, it can be a terrible trap,” she said. In 2010, Portman earned an Oscar for best actress, among other top acting awards, for her role as a perfectionist ballerina who slowly unravels during rehearsals for Tchaikovsky’s “Swan Lake” in Darren Aronofsky’s psychological thriller “Black Swan.” Although she accepted the part believing she could perform the difficult dance moves, Portman said she quickly learned that she was ill-prepared for the film’s footwork, forcing her to redouble her efforts to get it right. “If I had known my own limitations, I never would have taken the risk, and the risk led to one my greatest artistic and personal experiences,” she said. She urged students to take advantage of the brimming self-confidence of youth and take chances even at the risk of not coming out on top. At his first Class Day celebration as Harvard College dean, Rakesh Khurana asked the seniors to consider how they will take the knowledge they’ve gained at Harvard and use it to change the world in surprising, almost unimaginable ways, much like Frederick Law Olmsted once took hundreds of acres of fetid swamp in the middle of New York City and transformed it into a majestic green oasis that is now known to all as Central Park. “What will be your Central Park?” he asked. 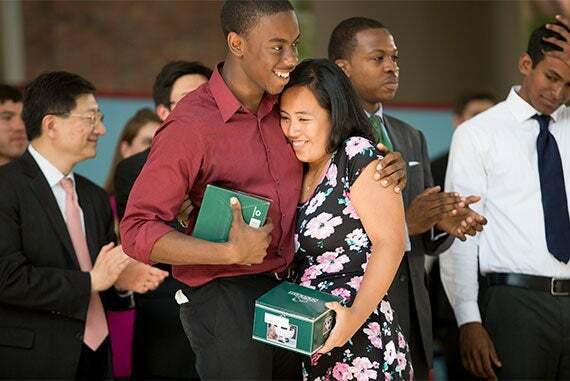 Fadhal Moore ’15 and Michelle Ferreol ’15 received the Ames Award. The honor is given annually to one man and one woman who exhibit exemplary leadership and passion for helping others without fanfare or acknowledgement. The award is given in memory of Richard Glover Ames and Henry Russell Ames, Harvard students and brothers who died while trying to save their father, who had fallen overboard during a storm off the coast of Newfoundland in 1935. Harvard orators Reina Gattuso ’15 and Ethan Loewi ’15 spoke to their classmates about self-awareness, while Taylor Kay Phillips ’15 and Sam Clark ’15 offered humorous remarks as the Ivy orators. “Knowing this language has improved the quality of my writing,” said Latin orator James P. McGlone '15 of his English composition, and he foresees the rigor and order of Latin helping him in law school some day.